Tess has never truly bonded with her increasingly disruptive three year old son, Freddie. He seems different from the rest of the family and she often wonders how she gave birth to a boy when she selected a girl via IVF. Finding out Freddie is not genetically hers is the beginning of her quest to claim back the daughter she so desperately wants. She becomes obsessed with Willow, the girl that was implanted into Annie’s womb by mistake. But when Tess’s behaviour becomes increasingly sinister, we fear she’ll do anything to get her own way. I empathised with both mothers in this story, but particularly Annie who is kind and level headed despite her flaws. Tess isn’t such a likeable character, but I was desperate to find out how her baby girl Ava had died, especially as she claims it was her and her husband’s fault. This thread of mystery along with how Tess burnt her hand, kept the pages turning as successfully as any thriller. Ultimately though, this is a story about families and the driving force in this novel is the question – will Freddie and Willow be swapped back? The outcome may surprise you, for me it is an intelligent, realistic and deeply satisfying conclusion. 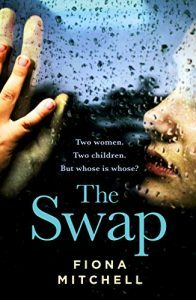 The Swap is a thought provoking read which left me emotionally battered! The last line – a question – sums it up because there are no clear or right answers. Fiona Mitchell presents this modern-day dilemma with courage and sensitivity.